Mali Mish - Day 175: Thanks for the memories, Florida. Day 175: Thanks for the memories, Florida. 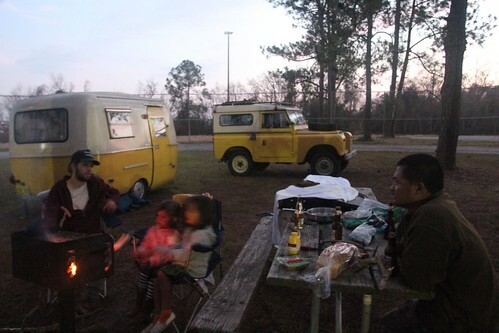 Last night I dug through our photos from Cedar Key and found one that showed the back of the yellow Landrover and trailer we have been seeing along our route. I remembered that they kept a blog and I was going to send them an a message through it about how we kept seeing them outside of our window. They quickly wrote back and we decided that we should get together for a chat in the morning before we parted ways once again. As morning came, we readied ourselves at the same leisurely pace and found them to be doing much of the same. As we finally got to meet them in person, we learned that Drew and Danielle are from Nova Scotia and are recent college grads. They are taking a road trip as graduation presents to themselves. 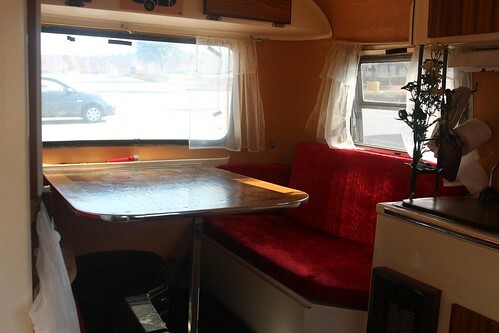 They drive around in a vintage 1960 Landrover towing around a 1976 vintage Boler Deluxe trailer. 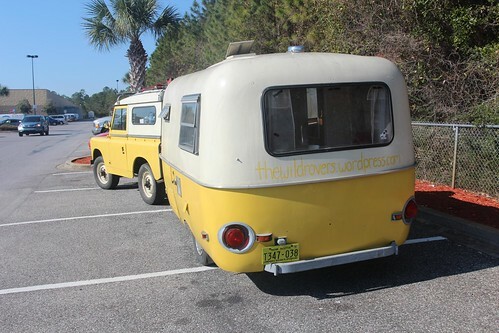 Both of which were painted a cool white and yellow two-tone that you cannot miss as they drive down the road. They have been on the road for about 4 months and will be starting to make their way back up to Canada in the next couple of months. It brings me back to those days when we were in college and all of those road trips we took south of our border into Mexico. If you are interested in following and looking back at their journey, go check out their blog at The Wild Rovers. 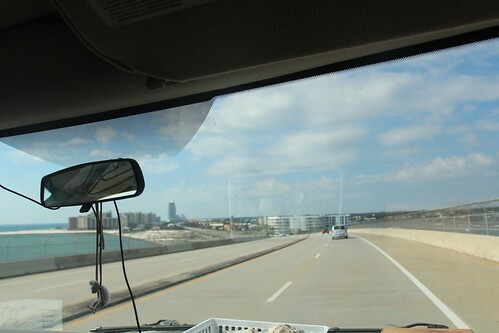 As we left Pensacola, the intention is to head towards Fort Morgan at the end of Perdido Key. 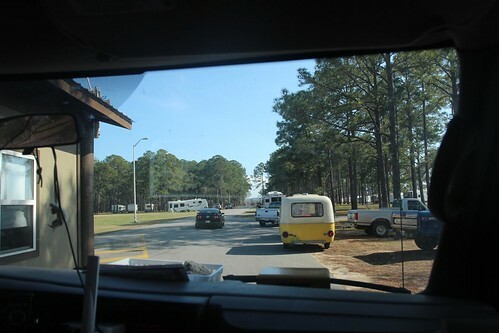 From there, we are suppose to be able to take a ferry across the entrance of Mobile Bay to Dauphin Island where we planed on staying a night or two at the county park campground there. 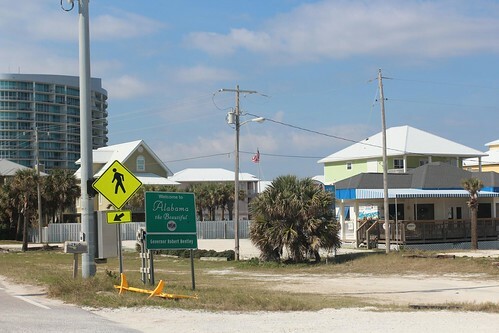 As we drove along the gulf past Perdido Key, we crossed into the state of Alabama. We have been in Florida just a few days shy of two months with about half of it spent in the Florida keys. We feel pretty good about our time here and were ready to move on. As we headed towards Fort Morgan, we found out via a roadside LED sign that the ferry no longer allows RVs and trailers. It was too bad since we had really been looking forward to taking the Mish on a ferry as we have not done it since we crossed Galveston Bay on one nearly 3 years ago. 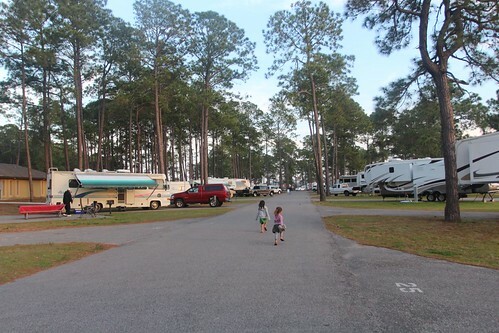 As we headed up to I-10, we decided to spend a night in Meaher State Park across the bay from Mobile, AL. To our surprise, The Wild Rovers were here, too! We snagged a full hookup spot for $34 a night which was a large pull through site. 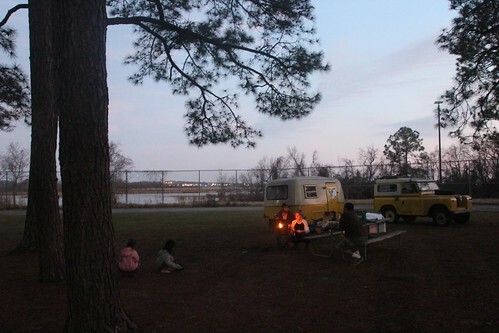 The state park is right next to Battleship Parkway and across the bay from I-10 as it crosses the bay. It looks beautiful and serene but there is a constant hum of the 2 roads as the cars buzz across them. We are planning to be here just for the night before heading out into Mississippi tomorrow. Last time we came through Mobile, we only stopped for the day to see the battleship and ate dinner at a bar and grill downtown. 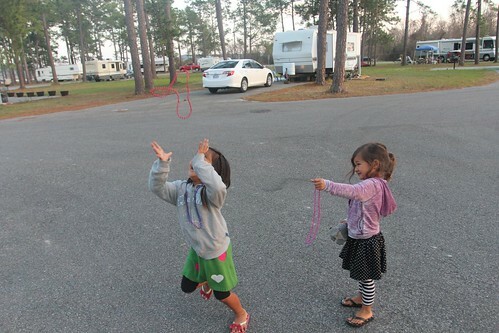 Even though it is easy to hit 4 states from Florida into Louisiana along I-10 in a single day like we did last time, we have always felt a little guilty when we tell people that we have been to Mississippi and Alabama. 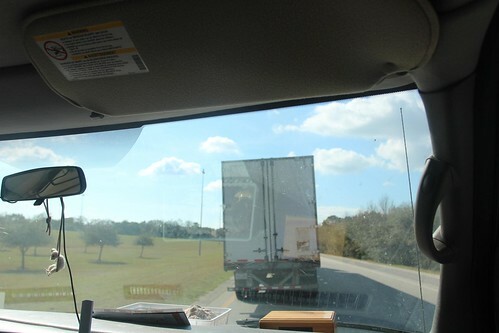 As a matter of fact, we never even stopped the car in Mississippi. We are going to try to remedy that with at least a single night’s stay in each state. It will not even come close from doing it justice but at least we won’t feel as guilty when people ask us if we have been there. 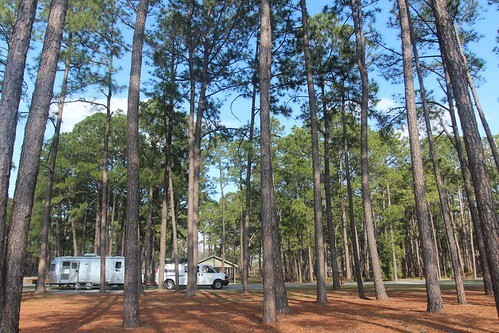 The campground here at Meaher State Park is really nice and each site is big and open. 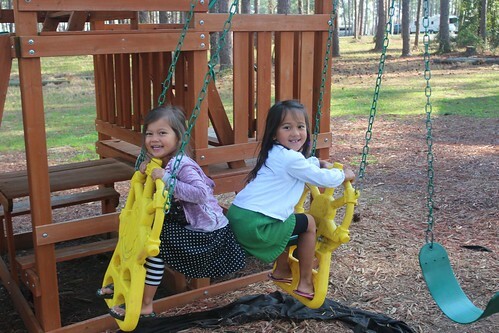 The facilities are pretty new and they don’t have a 14 day limit for campers like all of the parks in Florida do. As a matter of fact, their monthly rate is an amazing $500! There are a couple dozen waterfront sites that face the bay and is a great option for people visiting Mobile, AL since it is a short drive across the bridge to downtown. 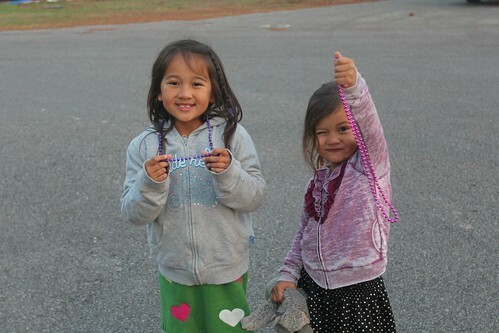 We know we are getting close to Mardi Gras as the girls are starting to get free beads from strangers already. At least they didn’t have to go through the ordinary French Quarter’s custom to attain them. Down at the other end of the campground is the primitive camping area. 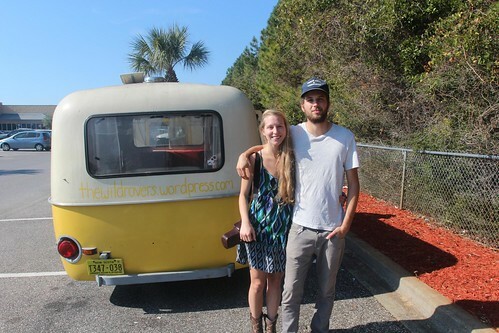 Our new friends Drew and Danielle opted for no hookups at a mere $10 a night. Come to think of it, we probably should have done that as well since we are only spending one night here. Drew and Danielle invited us to come by for some hot dogs over their fire and the girls were thrilled to be able to roast some marshmallows. Being almost 15 years younger than us and having no kids, their lives on the road are significantly different. They are helping us recall fond memories of our road trips when we were their age and how roughing it on the road was what we looked forward to back in those days. We hope one day soon we will be able to make our way into their home in the Canadian province of Nova Scotia. For now, I suspect we will be seeing them a fair amount down the road. Day 174: Leaving Seaside for Pensacola. 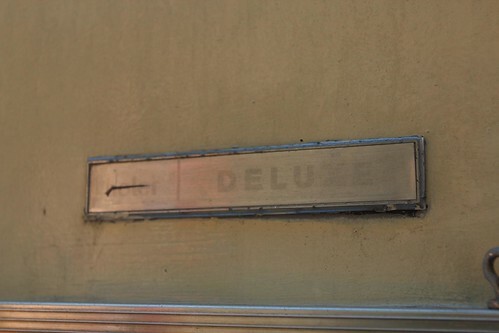 3 Responses to Day 175: Thanks for the memories, Florida. Nova Scotia is fantastic! 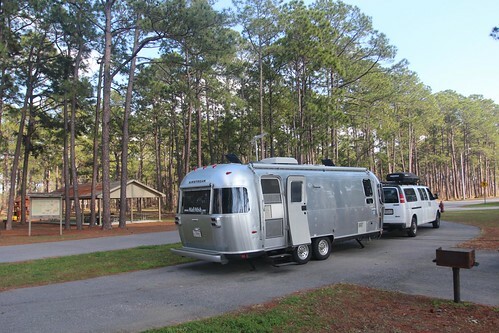 We took our Argosy there in 2010 and will go back with the Safari this summer. Stunning scenery, lovely provincial parks. Dan, I thought you were 15years younger than you are! Can you send me a link to their site. Debbie and I will be in Nova Scotia this summer. @Tom – We are hoping to make our way up there soon!